​EDAS FOX Ultimate Investigator-X-99 2016 Series-Get Ahead, Stay Ahead! Forensically Optimized for eXploitations)“Ultimate Investigator” edition is a high speed dual CPU system featuring the latest in Intel based CPU Technology. The EDAS FOX “Ultimate Investigator” was designed to bring the very best in processing power to today’s forensic investigators; Combining dual high-speed multi-core processors, high speed Error Checking Memory, and a high performance SSD RAID gives you the best performance available. All EDAS FOX Systems are user friendly, and support all Windows based forensic platforms. The addition of a Raid Array to the system gives you a perfect package to process and store data all on one machine. Included in each system is an evaluation license of the HTCI LABS DART software for complete cell phone analysis capability without any additional equipment required. EDAS FOX Optimized With RAID- X-99 2016 Series-Get Ahead, Stay Ahead!. 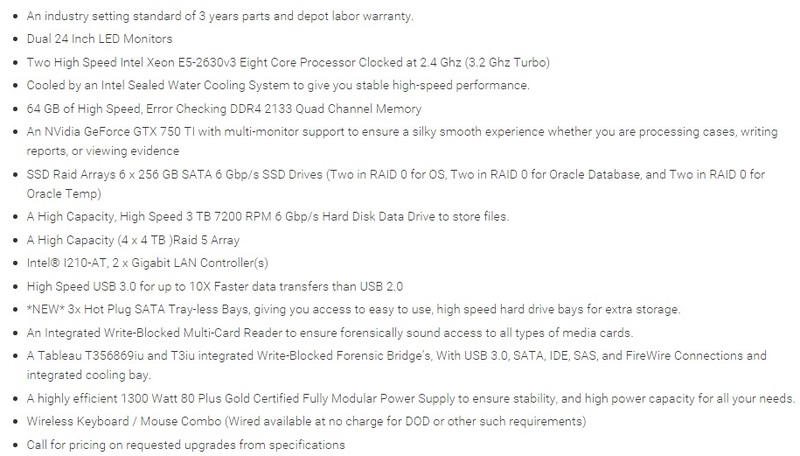 Forensically Optimized for eXploitations)“Optimized with Raid” edition is a high speed dual CPU system featuring the latest in Intel based CPU Technology. 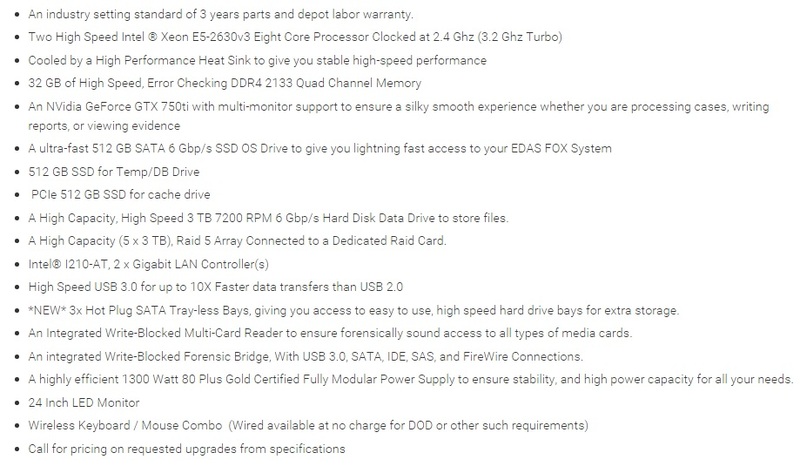 The EDAS FOX “Optimized with Raid” was designed to bring the very best in processing power to today’s forensic investigators; Combining dual high-speed multi-core processors, high speed Error Checking Memory, and a high performance SSD to give you the best performance available. All EDAS FOX Systems are user friendly, and support all Windows based forensic platforms. The addition of a Raid Array to the system gives you a perfect package to process and store data all on one machine. Included in each system is a demo license of the HTCI LABS DART software for complete cell phone analysis capability without any additional equipment required. 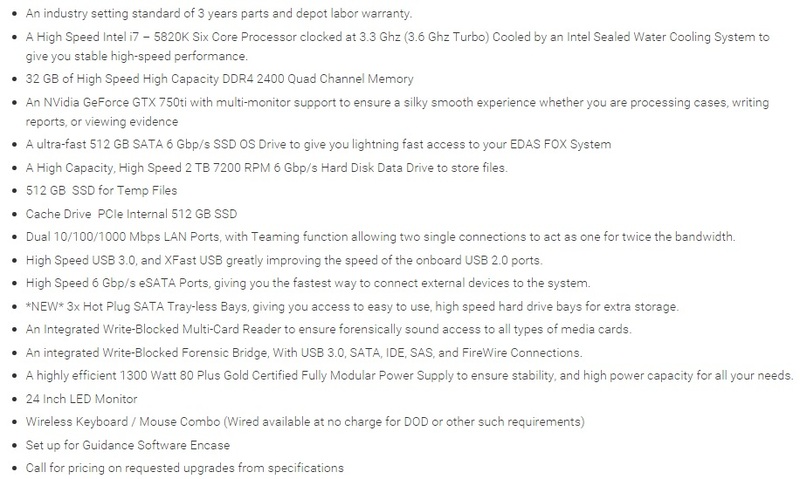 ​EDAS FOX Optimized-X-99 2016 Series-Get Ahead, Stay Ahead! Forensically Optimized for eXploitations) “Optimized” edition is a high speed dual CPU system featuring the latest in Intel based CPU Technology. The EDAS FOX “Optimized” was designed to bring the very best in processing power to today’s forensic investigators; Combining dual high-speed multi-core processors, high speed Error Checking Memory, and a high performance SSD to give you the best performance available. All EDAS FOX Systems are user friendly, and support all Windows based forensic platforms. Included in each system is a demo version of HTCI LABS DART software for complete cell phone analysis capability without any additional equipment required. 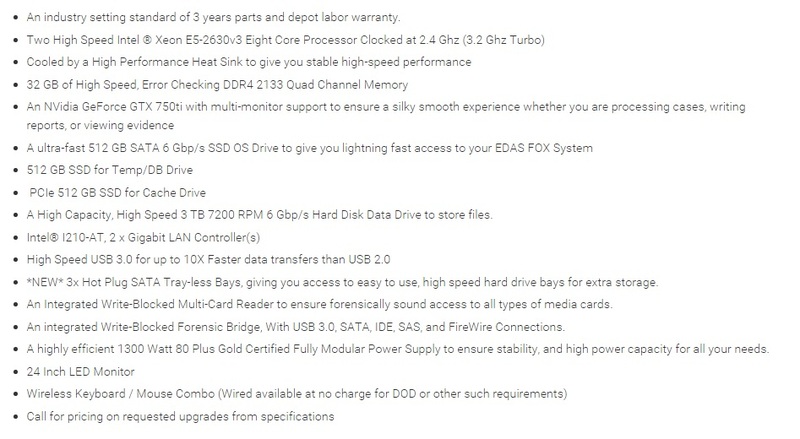 EDAS FOX Standard-X-99 2016 Series–Get Ahead, Stay Ahead! ​Forensically Optimized for eXploitations) “Standard” edition is a high power, great value forensic platform for all professional forensic investigators. The EDAS FOX “Standard” was designed with today’s forensic investigator in mind; it combines a high-speed multi-core processorand ultra-fast memory with a high performance SSD to give you the most performance at a great value. All EDAS FOX Systems are user friendly, and support all Windows based forensic platforms. Included in each system is a demo license of HTCI DART software for complete cell phone analysis capability without any additional equipment required.